Linlithgow tennis star Colin Fleming has called a halt to his playing career to take up a new post as national coach for Tennis Scotland. The 32-year-old doubles specialist is hanging up his racket after a decade competing on the ATP tour to help spearhead the next generation of Scottish tennis players. He said: “I am excited to accept the position. My wife Gemma and I are fortunate to now have two amazing young children and I have been looking for the right opportunity to transition into the next stage of my career. “This role certainly represents that and it will be a privilege to take on such an important, exciting and challenging position within Scottish tennis. “There has never been a more exciting time for Scottish tennis with Andy Murray, Jamie Murray and Gordon Reid raising the bar with every week that passes. It is my job to put a system in place that ensures the next generation of players are coming through from our clubs to competing on the world stage. “My key priorities will be building the base of young quality players as well as ensuring our coaches are well-equipped to develop these players. 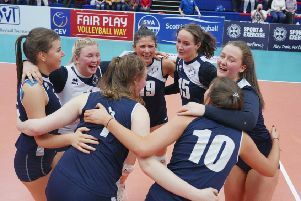 “Crucial to the success of any system is its people and I hope to be able to call on the many passionate and energetic people throughout Scottish tennis to drive the fantastic team atmosphere that was so crucial in the development of our current group of world-class players. “Finishing playing is not a decision I have taken lightly and I will never forget my time playing professional tennis. It was a dream to call playing tennis my job and I would like to say a huge thank you to all those that made it so enjoyable, from fellow players to coaches, fans, officials, staff, organisers, journalists, broadcasters, the list is endless. Colin takes up his role with immediate effect and will play a crucial part in maximising the Performance Strategy which has been developed with key input from Leon Smith, Tennis Scotland Board Performance Director and British Davis Cup captain. He said: “Tennis Scotland is absolutely delighted to be able to appoint someone of Colin’s calibre and background into this key role. Colin will be joining the organisation with invaluable experience of high performance tennis having spent a total of 10 years on the professional circuit. He has worked with some of the most respected coaches in tennis which has given him a strong understanding of the technical skills of the game as well as an understanding of what ‘world class’ means when it comes to coaching and creating a performance environment.